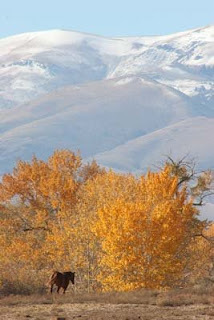 Don't give up on fall here yet... while on the whole, the cottonwood leave colors were lackluster this year, there are a few trees right up our creek that, when the light hits them just right, flame up below the snow-covered Owyhee mountains. Maybe the last cold snap we had (the one that dumped the snow) helped. Steph swears she will spend the winter here in Oreana, but I have a feeling, that when I pick her up at the airport after a month in extremely hot and humid Malaysia and the hot desert of Bahrain, she just might unload her bags straight into her horse trailer when she gets home, throw her horses on, and head south to sunny and warm Arizona.